Computer in each apartment with free ADSL Broadband Internet access. Original paintings by 3 different talented local artists. Cot, high chair, pushchair, plastic utensils and cutlery available free of charge. Stereo with CD and radio in each apartment. Well-equipped kitchen with plenty of pots and pans, a toaster, kettle and percolator. 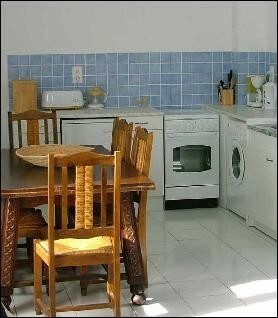 Washing machine, oven and microwave in each apartment. 2 irons and 2 ironing boards. Board games and books in English. At least one English electrical adaptor per apartment. Use of the pretty South-facing terrace. Please see the links on the left for more information on the holiday rental in Couiza - which also includes links to holiday attractions throughout Aude and Languedoc Roussillon, South France. 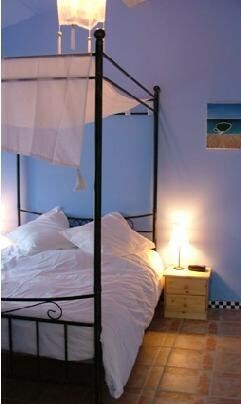 Holiday rentals in Couiza, Aude, South France. 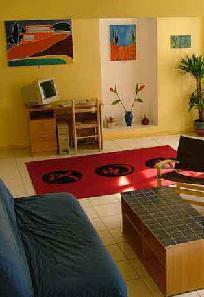 Spacious gite with computer and internet access.